I realize that It's DIY Tuesday, and this isn't technically a DIY project. But, I just had to share this darling hair tutorial, spotted on A Cup of Joe. Plus, summer is right around the corner and I thought this would be a perfect look for those hot summer days! I have always had a difficult time finding the right way to style my hair. I have naturally wavy/kinda curly hair but it only looks good when I take the time to diffuse it or spend at least 30-40 minutes straightening it. But, if I'm having "one of those days" (you know what I'm talking about right)? I do the quick side pony or low bun. 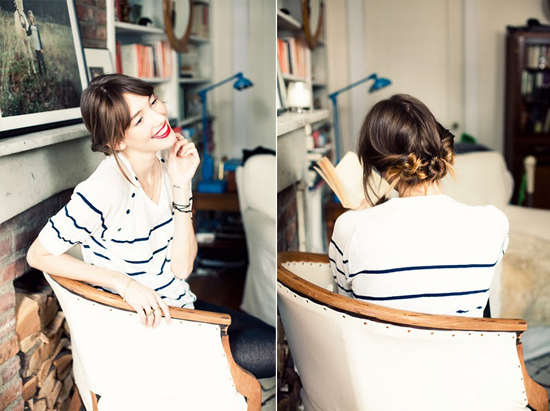 I was so excited to come across this lovely hair tutorial, the three twisted buns! Its fun, pretty, and best of all... easy! Head on over to A Cup of Joe for more pictures of this lovely hair style!